For a modern society pure water is viewed as a privilege. Clean water can be preserved through an understanding of products and processes that make it unavailable for common uses. Crop protection chemicals are only a part of complex structure of water contaminants that affect the quality of water. Critics had shared their fear for quality of surface water due to crop protection chemicals; few left no stones unturned to blame crop protection chemicals as the major reason of water quality deterioration. It is though known as a standard fact that increase in agricultural activity leads to deterioration of land and water bodies in locality, the recent Bengaluru lake disaster where fishes died had proven it once again. Environmental experts of centre for environment and agriculture say that fishes are most sensitive to inland water pollution. If it is true, then data should not support a statement that states with more agricultural production (naturally uses more crop protection chemicals) is also leaders in in-land fish production. If we look at Andhra Pradesh and Punjab such a myth can be cleared and hoax of crop protection chemical as major water pollutant may become in evident. 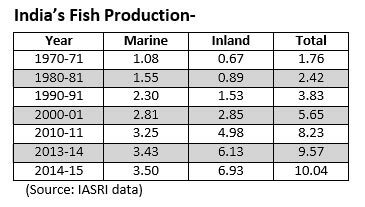 The data in above table shows that fishery production in India has grown widely since 1970 and most (around 2/3rd) of the fish production in India comes through in land fishery sources. This simply means that a so called in land source pollution from crop protection chemicals wouldn’t had led to a good fish production. Punjab has also emerged as one of the largest in land fishery producers of nation along with largest user of crop protection chemicals in India (Ministry of Agriculture). To relate the weak linkage between impacts of crop protection chemicals run off, on inland fisheries, the table above has shown production in top five states of nation, over past five years. Again if we look at the FSSAI’s norms for maximum residue level (MRL) of chemicals in samples of in land fishery, some 1,921 samples were analysed and only eight of them had been traced with higher than MRL for pesticides. Whom to blame and why to blame will be a big question mark to respond, when it comes to rumours that excessive usage of crop protection chemicals had seriously affected aqua production of inland water bodies.